The Bunker Hill Monument was built to commemorate the Battle of Bunker Hill. 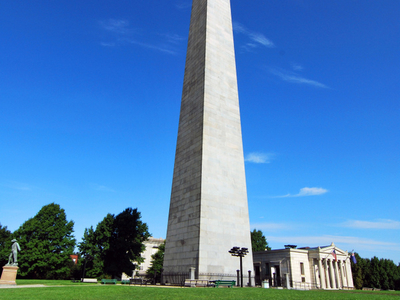 The 221 foot (67 m) granite obelisk was erected between 1827 and 1843 in Charlestown, Massachusetts, with granite from Quincy, Massachusetts, conveyed to the site via the Granite Railway, built specially for that purpose, followed by a trip by barge. There are 294 steps to the top. The Bunker Hill Monument is not on Bunker Hill but instead on Breed's Hill, where most of the fighting in the misnamed Battle of Bunker Hill actually took place. The Monument Association, which had purchased the battlefield site, was forced to sell off all but the hill's summit in order to complete the monument. The monument, one of the first in the United States, was erected to commemorate the Battle of Bunker Hill, the first major conflict between British and Patriot forces in the American Revolutionary War, fought there June 17, 1775. The first monument at the site was created in memory of Mason and fallen Bunker Hill hero Dr. Joseph Warren in 1794 by King Solomon's Lodge of Masons and was initially an 18 foot (5.5 m) wooden pillar topped with a gilt urn. In front of the obelisk is a statue of Col. William Prescott, a native of Groton, another hero of Bunker Hill. Here's the our members favorite photos of "Monuments in Boston". Upload your photo of Bunker Hill Monument!